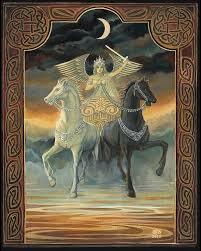 7 the year of the Chariot, a time to get moving in the direction of your dreams – no excuses any longer! You will find this year will offer boundless support for whatever your heart/mind desires; the difficulty is that we mere humans tend to get all balled up trying to figure out what is going on between our hearts and our minds. We feel too much and we think too much. In our attempts to be conscientious human beings we feel our way through a wide bevy of emotion ranging from starry-eyed love to debilitating fear and think our way from logic to worry and everything in between. It can leave us in a place of unresolved conundrum, with time slipping through our fingers. The energy of the number seven will bring you to your destiny, and while we fantasize and quietly, fervently hope that there exists some master plan and divine purpose that is personally chosen for us, we never seem to quite know how to trust that we’ve actually found it or even the path toward it. We struggle in this dualistic world to consider all mitigating factors weighing everything against our wavering feelings and long for a heaven sent message via anyone; guides, angels, friends or strangers who can say they know what we ourselves do not. The problem is that you and only you can and in fact must determine your own path and purpose. Only you have the insight and wisdom that is needed to face all your weaknesses with all your strengths. The energy of 7 affirms our inner sense of victory, of alignment and validates that we have achieved a true awareness. And for a moment we feel crystal clear and positive that we are on the right track. In the next moment however we begin to wobble. There is a surreal quality to the energy this year where reality and fantasy seem to overlap and present us with doubts and confusion. You will face your demons this year – the ones that steal your success and power right out from under your nose. 7 is a number of creative power and wholeness. 7 encompasses the whole of our spectrum of living, 7 musical notes, 7 chakras in prismatic colour, 7 days of the week, etc. In the energy of 7 we are blessed with knowledge of the whole of a situation and are presumably thereby able to make informed decisions and take decisive action. However, with hard work comes avoidance, with vision comes blindness, and with survival comes challenge. Ultimately this will be a stressful year, rife with equally grounded arguments for opposing points of view. To overcome this year of contradictions you will have to master your willpower, your self-control, be patient as never before and driven as though steering a chariot through the gates of hell toward your dreams.